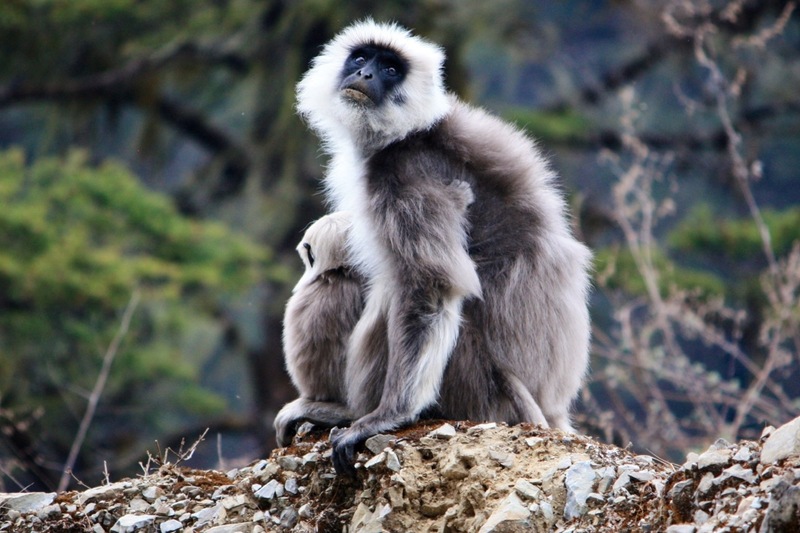 First off, meet these cheeky grey langurs we met steeling bags of salt near the pass at Pele La. 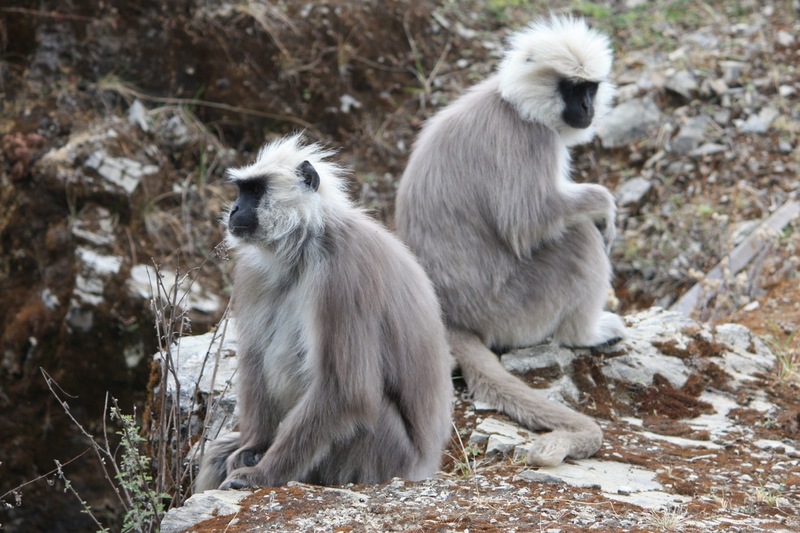 They’re not rare, but they were very amusing to watch and better equipped for the chilly climate than we were. And, at the very top of the post, the fortress-like Dzong at Trongsa, historically a powerful strategic gateway between east and west Bhutan. We’ve been back from our adventures for over a week now. The tan is fading and the post holiday glow has definitely worn off. With details of our trip already being displaced in the memory by everyday ‘stuff’, it’s high time I got on with the next installment of our Bhutanese odyssey…. The road from Bumthang, over the mountain passes of Yotang La and Pele La, winds tortuously through some of the most spectacular mixed forest in the world. I use the word road in the broadest sense, for, despite being the main route between west and east Bhutan, the uneven surface and narrow width would more usually qualify it as a rough track. Combined with chilling heights, drops to the side of over 500m and frequent landslides, it makes for quite a thrilling ride. Throw in a few colourful lorries moving at speed in the opposite direction to keep things interesting. 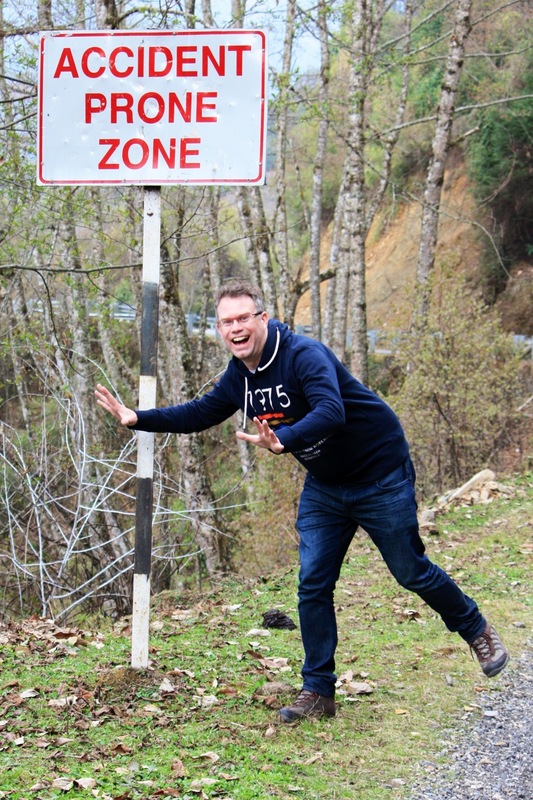 We were amused when our driver stopped the car to give us a leg stretch right next to the only sign we ever saw warning motorists of any danger. Pardon the pose, it just had to be done! Note, in the background, the ghostly white stems of Rubus biflorus. Whilst autumn is usually associated with stunning displays of leaf colour, here in the Himalayas spring gives fall a run for its money. Foliage in shades of copper, russet, burgundy, coral, pink, tan, caramel, gold, olive, lime and silver burst forth across vast swathes of forest, creating an intricate tapestry of colour. 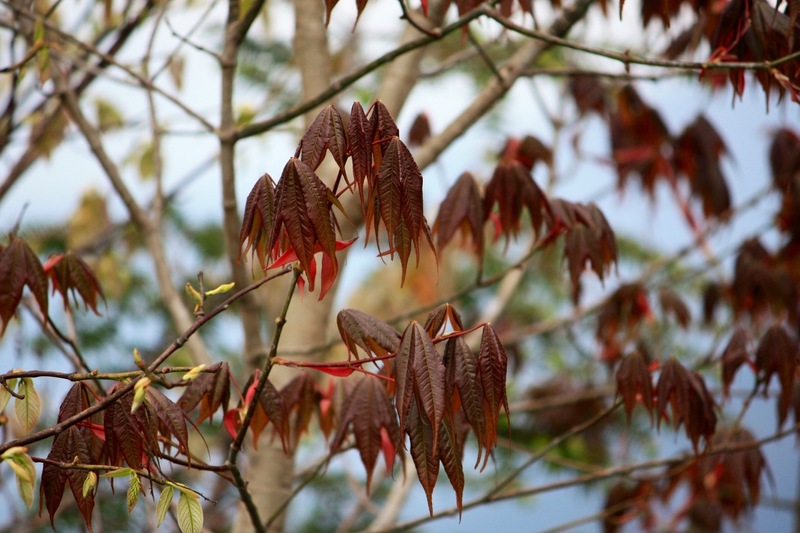 This serves to highlight the huge diversity of tree species present in Bhutan, no doubt supporting an equally spectacular array of animals and invertebrates. The towering pines and hemlocks, attended to by drifts of acers, oaks, cherries, birches and rhododendrons, made for the sort of magical landscape I’d normally associate with Japan. I am sure some of these leaves must have belonged to the offspring of this venerable, but very upright specimen of Prunus serrula tibetica, the Tibetan cherry. Bark like this doesn’t develop overnight and I’ve never seen a cherry quite so tall and impressive as this one. 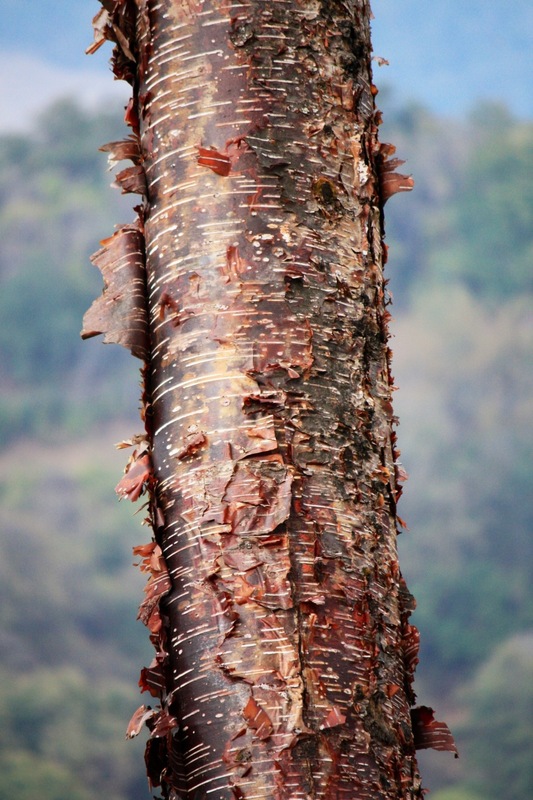 Higher up towards the passes, equally shaggy birches, such as Betula utilis, the Himalayan birch, sport peeling layers of coppery orange. 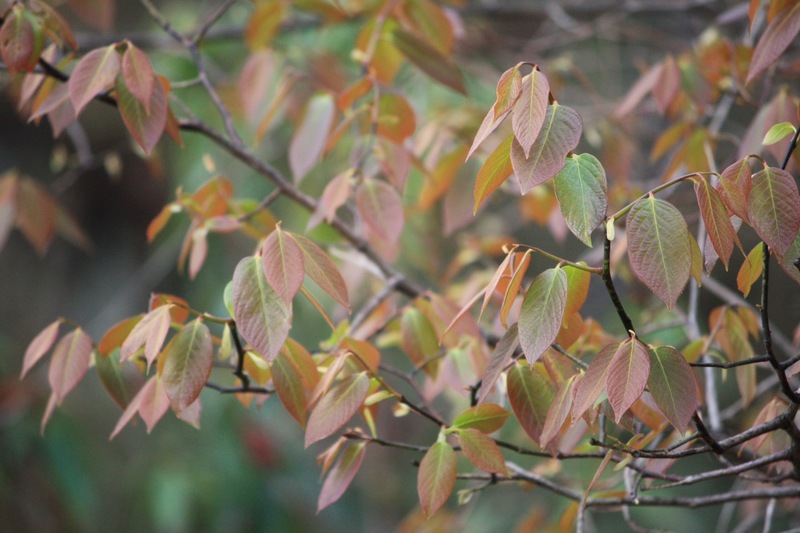 A commercially available selection called B. utilis ‘Bhutan Sienna’ is available from Stone Lane Gardens in Chagford, Devon. Despite the gorgeous greenery, I’m still a sucker for pretty flowers. We turned a tight corner, round a typically rocky outcrop, and there to our side was an enormous grove of sparkling white rhododendrons. In full flower, the blooms were as big and luscious as any modern hybrid, but all the better for not being tampered with. 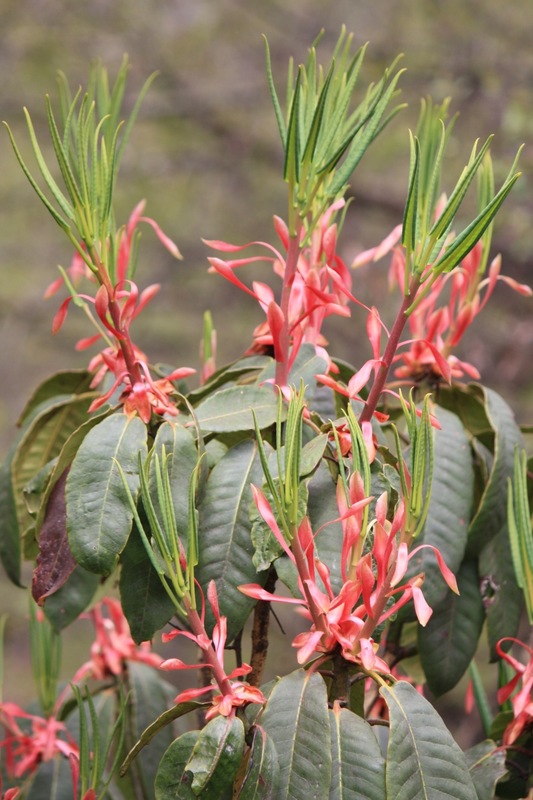 I have no idea what the species is, but the remarkable salmon-pink buds must surely give the game away for someone? 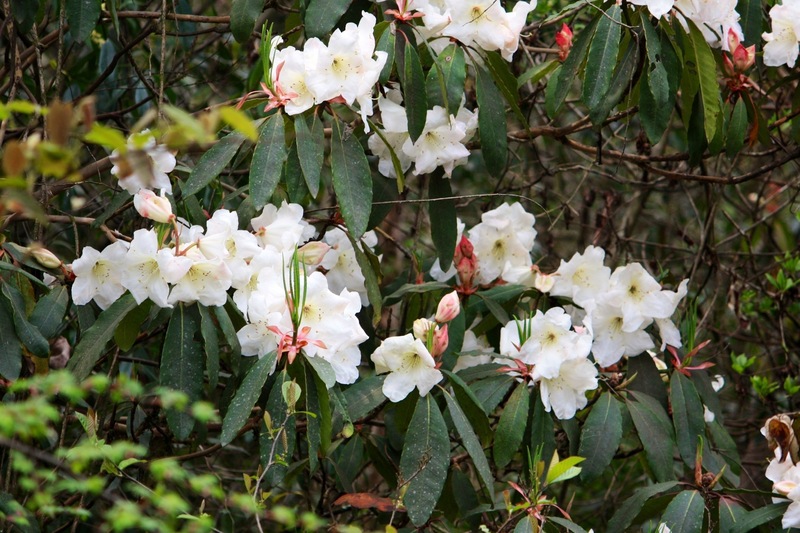 Clinging to the rocks on the other side of the road was pretty pinky white Rhododendron virgatum. By this stage of the trip I was starting to become more adept at identifying plants whilst travelling at 30km an hour, but there was still one particular tree I was desperate to see. 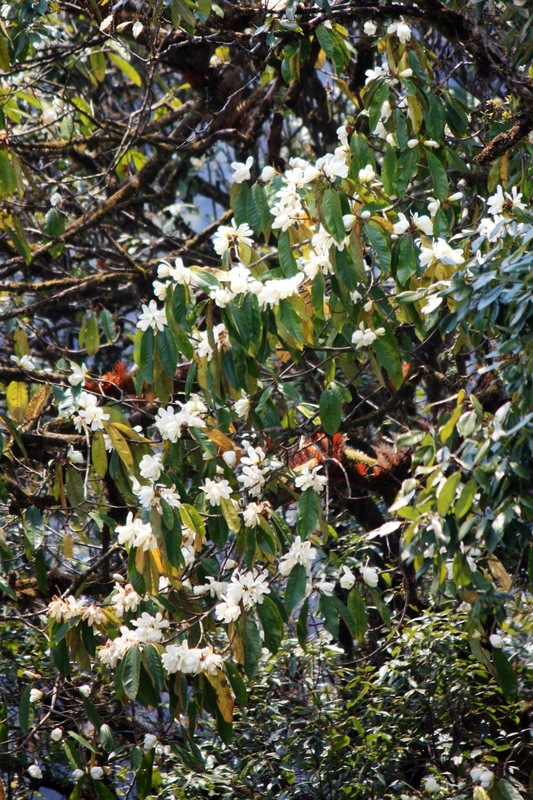 Closely related to magnolias, Michelia doltsopa, is a unique plant, native to Bhutan and the Eastern Himalayas. Here, close the mysterious Black Mountains in central Bhutan, it grows to over 100ft tall. Without flowers it’s hard to pick out from the other evergreens, but down a steep slope, with its crown level with the road, was one in full bloom. The stiff breeze carried the heavy scent of the white flowers towards us in great drifts, the sun catching the loosely held petals. Truly magnificent. For UK gardens there’s a hybrid called ‘Silver Cloud’ available from quality nurseries such as Burncoose in Cornwall. Sadly it’s not reliably hardy, but perfect for anyone who has space and enjoys a challenge, or anyone who simply wants to impress the neighbours. Beneath was a smaller but equally impressive tree that I’ve so far been unable to identify. It was pretty hard to miss, being smothered from top to toe in racemes of fluffy white flowers. These were very popular with the bees, who must have thought all their Christmasses had come at once! 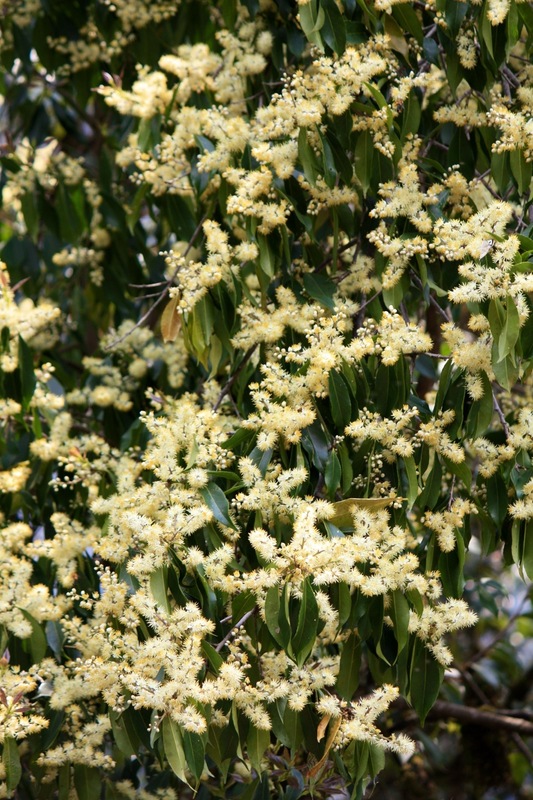 Whatever its name, it was a beautiful compact tree and clearly evergreen. This part of the world must be as close to paradise as it’s possible to get on earth. Sadly, even in Bhutan they need electricity and already pylons are starting to march along the fringe of the Black Mountains. At the small town of Trongsa, the massive Mangdechhu Hydro power project will doubtless bring valuable revenue into the country, but at what cost? One can only hope that the policy of good governance and measured progress that Bhutan has followed for over a hundred years will prevail, and that paradise, here at least, will never be lost.